, a new organization aimed at connecting campers, backpackers and nature lovers around the world. 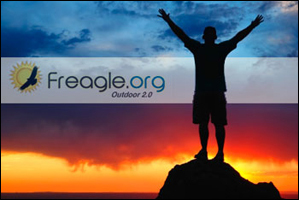 Freagle is a privately funded organization run by volunteers with the goal of providing people like us the chance to travel around the world easily and inexpensively through encouraging hospitality and mutual help between those who love the outdoors. How does this work? It all starts with joining Freagle as a member. This is easy and more importantly, free. With your membership you get access to the list of Freagle campsites. These sites are located around the world and are provided by Freagle members to Freagle members for free. At these sites you have a place to set up your tent and access to water. As Freagle member, it’s asked that you help the community grow by hosting a new campsite or helping to locate new sites. Currently, there are Freagle campsites in 6 different countries including New Zealand, Ireland, Germany and France. At this time, there are no sites in North America. If you are interested in learning more, want to join or want to host a camp site, click on the image above.